For those not familiar with 2003’s “The Room”? I would suggest you buy/rent a copy as soon as possible. I’m not recommending it as a quality drama, mind you…I’m recommending it as one of the funniest (albeit unintentional) comedies ever made. It’s right up there with any of the worst of the Ed Wood canon, and perhaps even more nonsensical. The movie was a $6 million passion project of (and entirely financed by) one Tommy Wiseau; a man who looks and sounds like Count Dracula’s lazy-eyed, drug-addicted cousin. ^ “The Room”’s real-life writer/producer/director Tommy Wiseau, looking about as ‘all-American’ as the soil in Dracula’s coffin. The ‘story’ (using the term very loosely) has Wiseau playing a wildly-unconvincing San Franciscan yuppie named “Johnny” who loves “Lisa” (Juliette Danielle). Lisa’s mother is randomly revealed to have cancer with absolutely no dramatic reason or followup whatsoever. Lisa, it turns out, is also having an affair with Johnny’s best friend, Mark (played by Wiseau’s real-life on/off again bestie, Greg Sestero). A street football game is played in tuxedoes (!?). Oh, and some random neighbor kid named Denny (who “likes to watch” as Lisa and Johnny make out) is being threatened by a neighborhood drug dealer curiously named “Chris R” (in another thread that is just dropped). Johnny is so upset by Lisa’s infidelity that he announces he’s “Fad ahp wit diss wuurrld…” (that’s Wiseau-speak for “fed up with this world”), and blows his brains out. Lisa feels bad. The movie went on to become a cult classic, and has been showing up at “Rocky Horror Picture” style midnight showings ever since. I myself finally rented it (via Discflix) about a year ago, and it was STUNNINGLY awful. It’s like human melodrama made by alien beings living somewhere beyond the orbit of Neptune. The dialogue is farcically unspeakable. The character reactions are baffling (Johnny laughs aloud after Mark tells him about a girl who was viciously beaten up…!). Cut to 2017, and actor/director James Franco has put together a making-of comedy loosely based on a making-of book written by actual cast member Greg Sestero (with a screenplay written by Scott Neustadter, Michael Weber, Tom Bissell and Sestero himself). Having just seen “The Disaster Artist” this afternoon with a lively crowd of about 20-30 or so people, I found it to be a nice little meta-comedy. The movie begins in San Francisco, circa 1998. 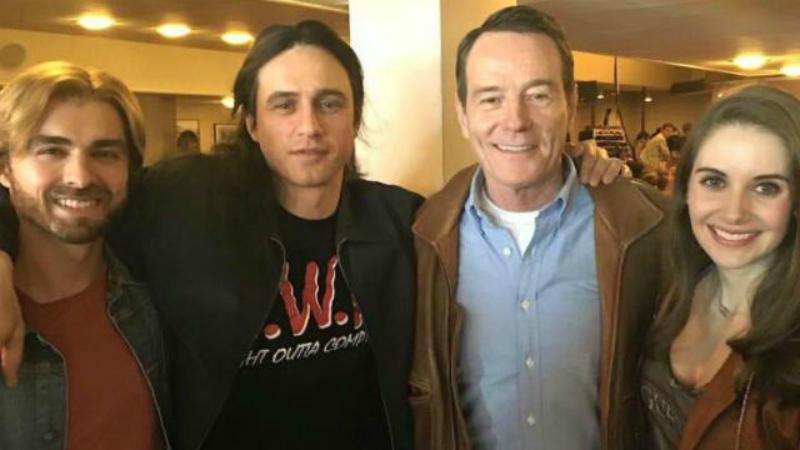 Young, would-be actor Greg (Dave Franco) meets eccentric, creepy, middle-aged fellow acting student Tommy Wiseau (James Franco, in a truly remarkable and disciplined comic performance). The two share dreams of going to Hollywood and making it in acting. Apparently, the eccentric Tommy (somehow?) has the capital to make it happen. Wiseau’s seemingly bottomless wealth is one of the movie’s many comic mysteries; along with his age, and his exact planet–er, place of origin (he sounds like Dracula, but claims to be from “the Big Easy” New Orleans). This is where the movie really kicks into high gear. Seth Rogan comes aboard as Sandy, an actual professional assistant director who helps Tommy keep his own horrific dialogue straight (with Tommy blowing take after take). While he has no comprehension of the goal of Tommy’s madness, he plays along… so long as he gets paid (which he most assuredly does). 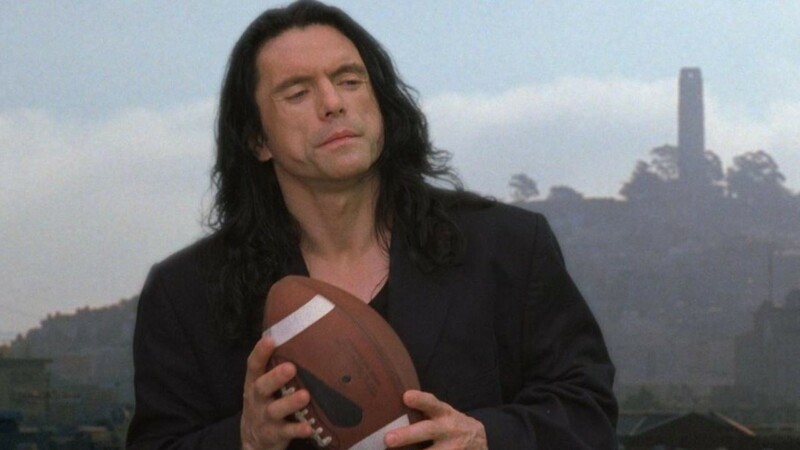 The cast and crew’s exacerbation and exhaustion with Tommy parallels the feelings of a newbie watching “The Room” for the very first time (I can vouch that it mirrored my own uncomprehending disbelief when I first saw the film). And in what is surely a fictional happy ending, the friends reunite as “The Room” gets a large Hollywood premiere with all the trimmings (a premiere that it never quite had in real life). 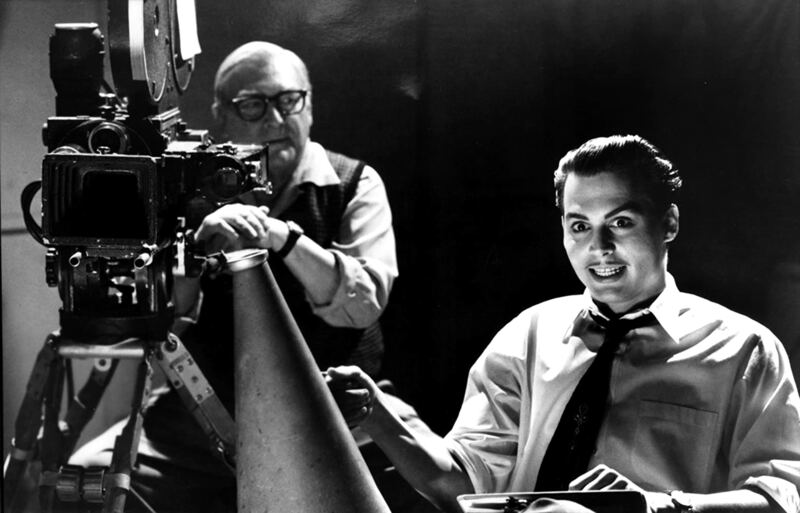 It’s a scene that mirrors the climax of Tim Burton’s masterpiece “Ed Wood”; which had Wood’s “Plan Nine From Outer Space” premiering at L.A.’s prestigious Pantages Theatre. Seeing the finished film for the first time, the cast and crew begin to realize that they have made an unintentional cult masterpiece. Laughter begins to break out everywhere (especially among the cast and crew) and Wiseau is devastated (Franco is excellent in these moments; bringing the perfect balance of humor and pathos). Tommy then exits to the lobby and is soon comforted by Greg; who reminds him that even though the audience is laughing at the movie, they’re also having a great time. This is the message and magic of “The Room” (and the magic of all so-bad-they’re-good movies). Artistic intent doesn’t really matter, so long as the audience is enjoying the final product. 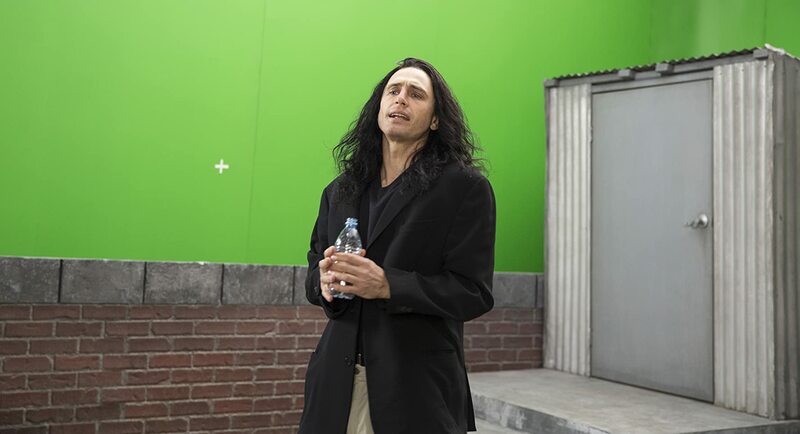 After the film ends, Tommy addresses the audience and tries to save face by saying the movie turned out exactly as he intended (and given Wiseau’s real-life inscrutability, maybe this was the case). If there’s any precedent to this odd little making-of movie, it’d be the aforementioned “Ed Wood” (1994) and perhaps even 1999’s Andy Kaufman biopic, “Man on the Moon” (though “Disaster Artist” is not necessarily as full an experience as either of those films). The story loosely follows “Ed Wood”’s trajectory, while the comedic performance of Franco as Wiseau is nearly on a par with Jim Carrey’s soul-capturing performance of the late Andy Kaufman in “Man on the Moon.” Franco doesn’t possess Carrey’s intensity, but the comedic impact is similar. ^ The brilliant Jim Carrey at the peak of his acting/comedic powers, channeling the late Andy Kaufman (channeling the late Elvis Presley) in 1999’s “Man on the Moon”; a precedent for James Franco’s impressive performance as Tommy Wiseau. Some familiarity with “The Room” is an advantage when seeing “The Disaster Artist”, but not necessarily a dealbreaker. If one hasn’t seen “The Room”, then this is just a funny film about the making of a horrible film, with a very eccentric central character and the people seemingly trapped in his orbit. 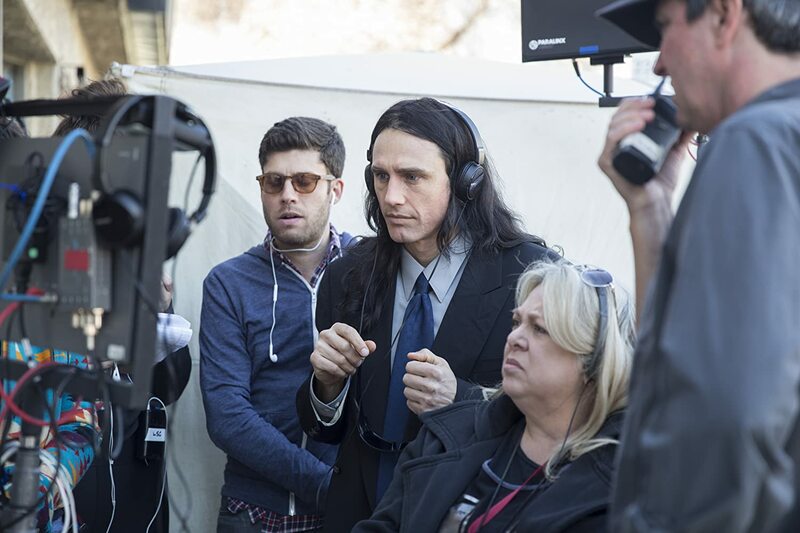 At a running time of 1 hour and 44 minutes, “The Disaster Artist” is more of a nicely drawn sketch than a full portrait; and considering the source material, that’s just fine. Any longer might belabor the point.